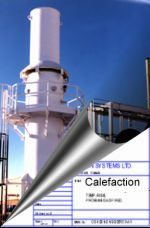 Calefaction is an industry supplier of custom designed Thermal Oxidizers, Air Heaters, Mine Shaft Heaters and Specialty Furnaces. Together with the companies we represent, we offer a complete range of combustion and environmental equipment to the Petro-Chemical, Mining, Pulp and Paper and Metals industries. © 2007 Calefaction Systems Ltd.